There are downsides to cycling a long distance on one's own like this (at least there must be, though I can't think of too many at this moment). But one of the absolute upsides is the people one meets. The Moroccan immigrant in a small hotel in France (whither I'd fled from the rain) talking over blood sausage and wine (that was me; as a Muslim he was on fruit juice and fish) about how in all his travels over 35 years he'd never met an individual, individually one-on-one, who was unpleasant. The others around our table – three labourers on a local drainage project, a toilet engineer down from Brittany and one wet English cyclist – all agreed. Taken singly, human beings are just great. It's in the group that we become a problem. Or the café owner also in France who was desperate for custom, praising Sarkozy as new President but predicting literally another bloody French revolution as ordinary people like him take guns and storm the banks. In all seriousness. But he did me a lovely lunch. Or the 60-year-old in my first Swiss restaurant who talked over lunch (escaping from the rain again) about the joy he gets, like my friend John back in St Etienne, from sending students on exchange programmes to England, and especially also a little late in the day from his only child, just 10 years old, but living separately it seemed in Geneva with his mother. Another complicated private life. 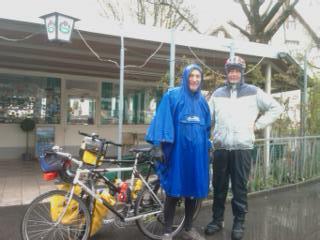 Or, today (71 miles after a warm dry night in my tent from one of the Steins on the Rhine to Bregenz, along the south shore of Lake Constance, very very wet and NOW OVER 1000 MILES in total since leaving home!!! ), three sets of real cyclists going real distances. 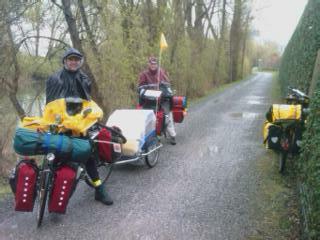 Alex and Sandra, from Clermont Ferrand in France, were on two massively-laden bikes (see pic) towing their seven-month old on her first major cycle trip around the Lake as a tester for something bigger. They have, at home, three tandems and 30 other bikes! My kind of people. And then there was Francesco from Italy at the other end of the scale, on a brisk four-day belt around the Lake with the minimum of luggage, all in a cape-covered backpack, no mudguards, and a relentless Italian enthusiasm. He too hates Berlusconi. If Francesco was of a Certain Age (early 50s? ), so is Hille, 54 and from Belgium, on a four-week slog down through Europe to Venice, using an umbrella to keep dry and an enthusiast, as I once was, for good value Lidl cycle gear. 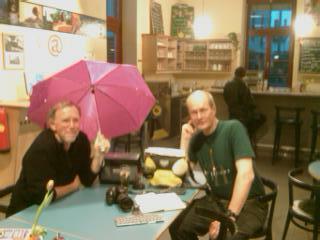 I think I arrived at the Bregenz Youth Hostel today drier than he had, but sans umbrella a lot less elegant. I may be thoroughly gloomy about the prospects for the human race as a result of what we 've done to this lovely planet of ours. (And theirs, as in other species, especially birds who travel at sort of cycling speed and are cheerfully and chattily everywhere I go). But my goodness, people are nice.